Following the record-breaking inaugural edition of Road to ULTRA Singapore in September 2015, ULTRA Worldwide now confirms the launch of a full-scale, two-day festival for Singapore in 2016! Taking place on September 10 & 11, 2016, ULTRA Singapore will be the next in a long line of festivals that have grown from the fabled Road to ULTRA series, and will see the event transform from a one-stage, indoor experience into an all-encompassing, outdoor, three-stage extravaganza. With the iconic venue to be announced very soon, ULTRA Singapore’s MAIN STAGE will be complemented by the diverse sounds of the LIVE and RESISTANCE stages. Dating back to 1999, ULTRA’s legendary Main Stages have played host to some of the most memorable acts in electronic music history. Expanding in size, technology and world-class production with each passing year, ULTRA Singapore’s offering will be no exception to the rule. The brand new festival location will also become the third country to host an ULTRA Live Stage, following in the pioneering footsteps of the flagship event in Miami and most recently, ULTRA Korea. Last and by no means least, ULTRA Singapore will welcome the RESISTANCE Stage to proceedings, which is set to bring together some of the finest names from the house and techno world to the Lion City for the very first time. 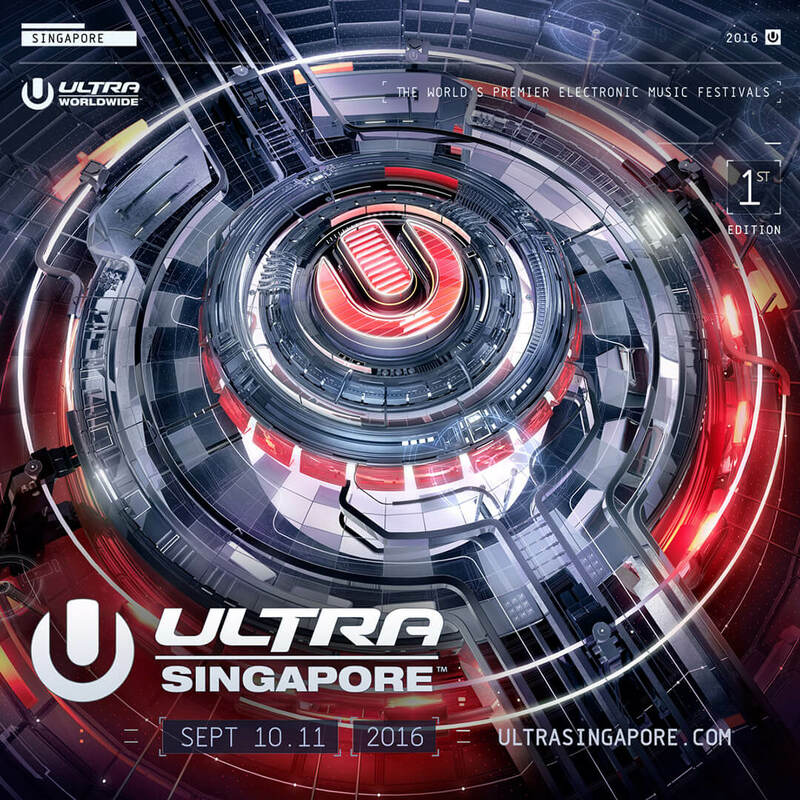 ULTRA brought superstar acts such as Skrillex, Alesso and Nicky Romero to RTU Singapore in 2015 and having packed out the Marina Bay Sands Expo & Convention with over 11,000 people, plans were instantly hatched to make Singapore the 11th nation to host a full-scale ULTRA festival in 2016. This time around, with two days and three stages worth of talent to bring to town, ULTRA is set to welcome even more incredible talent to Singapore, and smash its way into the record books yet again. With Early Bird tickets for RTU Singapore selling out in just 21 minutes back in 2015, fans will have to act quickly to guarantee their spot this September. To be in with the best chance to experience the action first-hand, register below for exclusive ticket news and information. Choosing to follow a unique, creative vision and a wholly organic growth focused around a true love for music, artists and fans alike, the ULTRA and ULTRA Worldwide™ brands represent not only the world’s biggest and most successful remaining INDEPENDENT electronic music festival brand, they are now the most international of any festival brand in the world by far. The event organizers continue to transport the unrivaled experience from the Miami flagship festival to an ever-growing number of destinations and fans all over the globe. Over the past seventeen years, literally thousands of the world’s most iconic DJs, producers and live acts have mesmerized audiences with awe-inspiring sets at ULTRA festivals in ARGENTINA, BALI, BRAZIL, CHILE, CROATIA, IBIZA, JAPAN, KOREA, SOUTH AFRICA and of course MIAMI, as well as ROAD TO ULTRA® events in BOLIVIA, CHILE, COLOMBIA, MACAU, PARAGUAY, PERU, THE PHILIPPINES, PUERTO RICO, SEOUL, SINGAPORE, TAIWAN, THAILAND, TOKYO and the USA. Each and every new global edition is founded on the same successful recipe that has been perfected over seventeen years in Miami, combining the most diverse electronic talent with the most technologically advanced, large-scale festival productions in the world. In addition, the ULTRA brands pioneered the live stream experience, ‘ULTRA LIVE’ (whereby the festival is brought online to over 20 million unique viewers globally) and the audio broadcasting platform ‘UMF RADIO’ (syndicated to FM Radio in over 42 countries and reaching more than 22 million listeners weekly). Also UMF FILMS’ collaboration with FINAL KID has seen some of the most visually breathtaking festival aftermovies in the music space, including a feature-length documentary exploring the explosion of dance music, entitled CAN U FEEL IT, which premiered at the Ultra Music Festival, Miami 2012 and was exhibited in over 500 theaters across the Unites States. In 2015, the ULTRA and ULTRA WORLDWIDE™ brands have continued to push the boundaries, bringing an unparalleled combination of cutting edge productions and the world’s best electronic acts back to previous strongholds and new frontiers across the globe. With its recent festival editions breaking records in JAPAN (September 2015), SOUTH AFRICA (February 2015), KOREA (June 2015), CROATIA (July 2015) and BALI (September 2015), and with the addition of the many new ROAD TO ULTRA® events all over the world, the ULTRA brand has now united NINETEEN COUNTRIES across FIVE CONTINENTS worldwide.